Michael B originally organised this walk for the Saturday but due to adverse weather conditions it was re-scheduled for the following day. Michael, Maureen and myself travelled together and met the others at the Bridge of Orchy Hotel carpark at 9.45am. Ian plus his 2 lovely chocolate labradors called Molly and Hattie, Steve M and Steven C were in the other car. Off we set crossing over the road and up to the train station then through the underpass. What a great day, sun shining with hardly a cloud in the sky. The mountain tops looked as though God had dusted them with icing sugar. We made steady progress to the bealach between Beinn Dorain and Beinn an Dothaidh. This is where it turned really cold and where we started to meet the snow and ice. Cloud appeared and soon we lost the wonderful view of the surrounding mountains. We took another path to the summit, not intentionally of course. Thankfully we were going up this path and not down it as it was rather narrow and slippy. 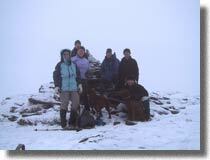 This added time onto our journey but we came up to the summit at 1pm from the other side from where we had intended. The decent was much easier than first thought but maybe that was because we were on the path we should have taken up! Back to the carpark for 3.30pm and a much deserved drink in the Bridge of Orchy Hotel. Molly and Hattie had a snooze in the car waiting for their master Ian to return. 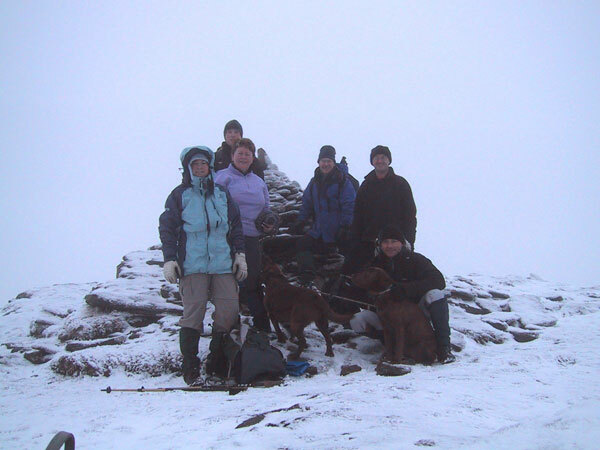 In the hotel we met up with Michael's son Joe and his wife Nicola who had climbed Stob Gabhar and Stob a Choire Odhair.